Genius Cascade Retractable Window Screens are designed for use on most window systems and provide a clear view through your windows when the screen is retracted. Opening Width *: 16" 17" 18" 19" 20" 21" 22" 23" 24" 25" 26" 27" 28" 29" 30" 31" 32" 33" 34" 35" 36" 37" 38" 39" 40" 41" 42" 43" 44" 45" 46" 47" 48" 49" 50" 51" 52" 53" 54" 55" 56" 57" 58" 59" 60" 61" 62" 63" 64" 65" 66" 67" 68" 69" 70" 71" 72" 73" 74" 75" 76"
Opening Height *: 12" 13" 14" 15" 16" 17" 18" 19" 20" 21" 22" 23" 24" 25" 26" 27" 28" 29" 30" 31" 32" 33" 34" 35" 36" 37" 38" 39" 40" 41" 42" 43" 44" 45" 46" 47" 48" 49" 50" 51" 52" 53" 54" 55" 56" 57" 58" 59" 60" 61" 62" 63" 64" 65" 66" 67" 68" 69" 70" 71" 72" 73" 74" 75" 76" 77" 78" 79" 80" 81" 82" 83" 84" 85" 86" 87" 88" 89" 90"
Vertical Guide Profiles *: 30mm x 22mm W/Brush Pile (Default) - Available in all standard colors. 30mm x 22mm W/Angled Wind Pile - Available in all standard colors. 08303003 - White - (1) Each - [Add $9.45] Recommended For Screens Wider Than 24"
08303005 - Black - (1) Each - [Add $9.45] Recommended For Screens Wider Than 24"
Genius Cascade Retractable Window Screens are designed for use on most window systems and provide a clear view through your windows when the screen is retracted. The Cascade Retractable Window Screen can be installed on the interior or exterior of the window frame. The Patented Genius Brake System provides a controlled retraction speed of the screen. 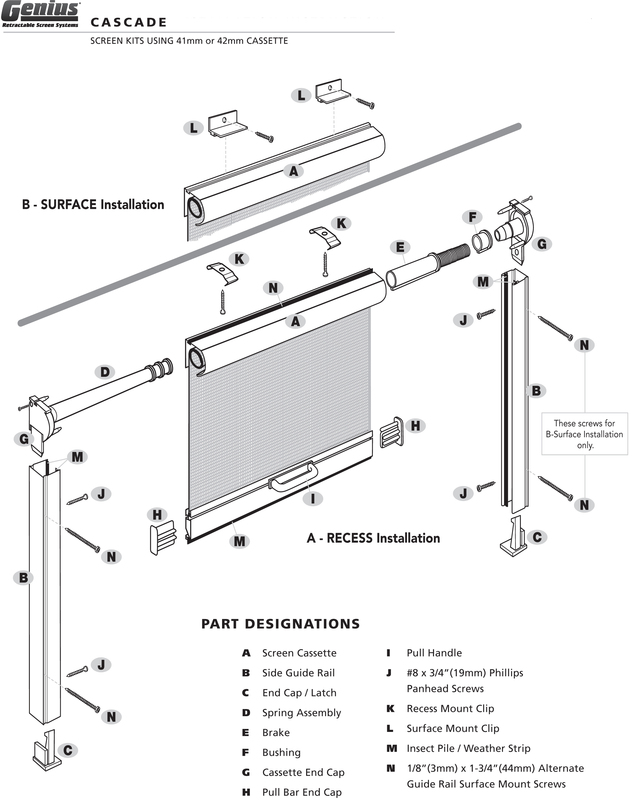 The mechanical latching system offers secure and easy operation of the screen system. 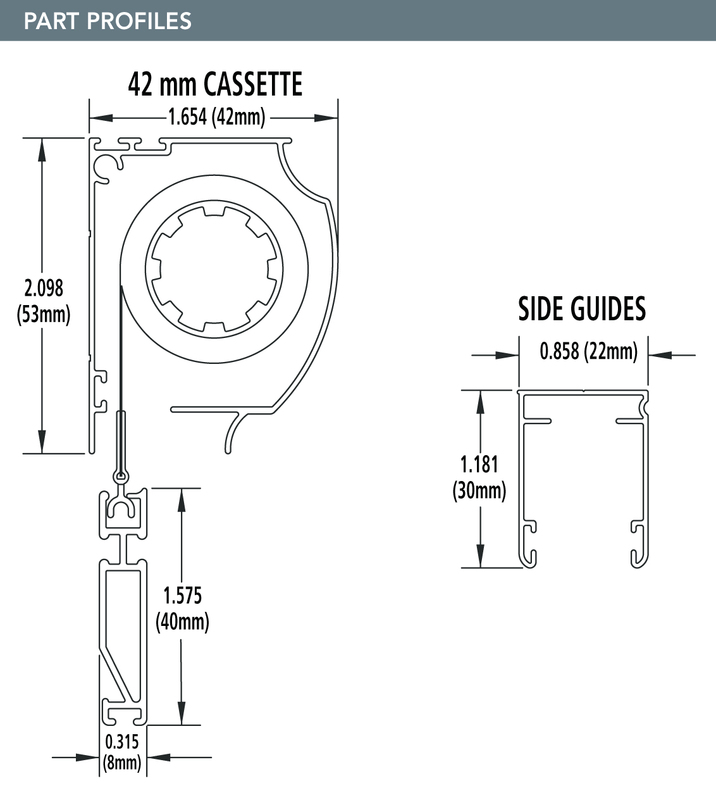 Click Here for Cascade Measuring & Installation Instructions.